Harvard President Larry Bacow speaking at Peking University. Universities are key drivers of innovation and transformation, centers of progress and collaboration, institutions that foster connection despite turbulent times, and havens of open exchange where myriad opinions and ideas offer solutions to the world’s most pressing concerns, Harvard President Larry Bacow told an audience in Beijing today. 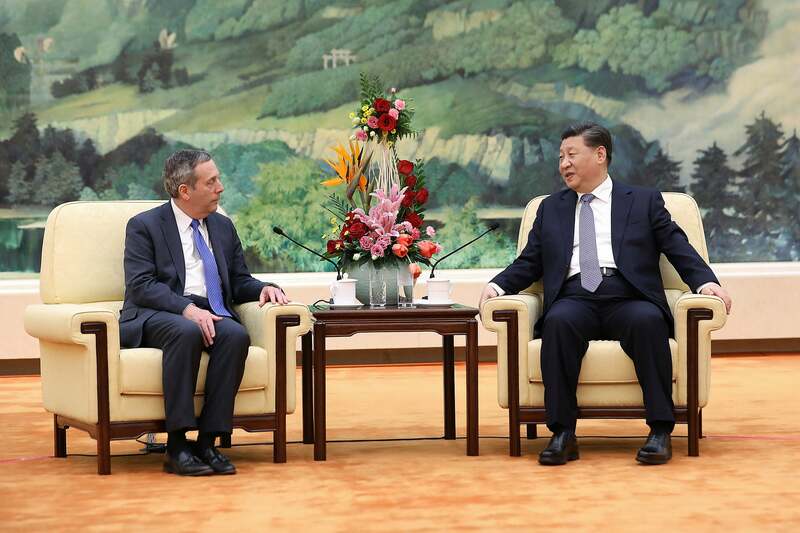 Bacow also met with Chinese President Xi Jinping later in the day to discuss the importance of learning and of cultural and educational exchanges. On his first overseas trip as Harvard’s president, he will travel to Japan after his China visit. During his speech at Peking University, the oldest such institution in China, Bacow addressed students, faculty, and administrators, telling them that “transformational thought and action” often take root on university campuses where intellectual freedom is paramount. Universities can also serve as “sources of strength through tough economic, political, and social times,” said Bacow. And facilitating connections between scholars from different parts of the world, he added, can change the course of history. As an example of the power of collaboration, Bacow pointed to the Pugwash Conference in 1957, an international gathering of scientists in Nova Scotia, Canada, who were gravely concerned about the fate of the world amid the threat of weapons of mass destruction and who considered peaceful negotiation the model for settling international disputes. “Their collective work helped to pave the way for the Partial Test Ban Treaty of 1963 and the Non-Proliferation Treaty of 1968, among other consequential agreements,” he said. “There were 22 attendees — seven from the United States, three from the Soviet Union, three from Japan, two from the United Kingdom, two from Canada, and one each from Australia, Austria, China, France, and Poland. Professor Zhou Peiyuan, a physicist and the sole Chinese member of the group, later became president of this great institution and, in 1978, led a delegation that arranged for scholarly exchange between China and the United States. We owe thanks to people like Professor Zhou Peiyuan for their farsighted and courageous leadership and for putting peace and mutual understanding above all other considerations. “As I speak to you now,” he continued, “our governments are engaged in important and at times difficult discussions over a range of issues — and those discussions have implications that reverberate around the world. I believe that sustaining the bonds that join scholars across borders is of the utmost importance for all of us gathered here today — and for anyone who cares about the unique role that higher education plays in the lives of countless people. As part of his visit, Bacow also addressed more than 300 members of the Harvard alumni community at an event in Hong Kong on Monday sponsored by the Harvard Alumni Association, the Harvard Club of Hong Kong, the Harvard Club of Beijing, the Harvard Club of Shanghai, the Harvard Club of South China, Guangdong, and the Harvard Club of the Republic of China in Taiwan. Bacow will also speak with Harvard alumni in Japan. 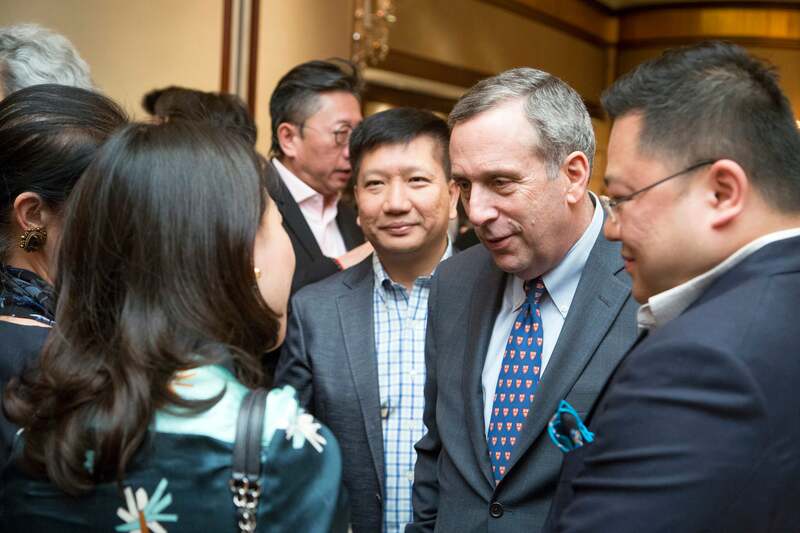 In his speech, Bacow traced Harvard’s long ties to China, and detailed the ongoing partnerships that have helped define their academic and intellectual engagement for more than 100 years. In 1879, prominent Chinese scholar Ge Kunhua traveled to Cambridge to become Harvard’s first instructor in Mandarin Chinese. The trove of books that accompanied him laid the foundation for the Harvard-Yenching Library, the third-largest of the University’s 12 libraries. With 1.5 million volumes, it is also “the largest academic library for East Asian studies outside of Asia,” said Bacow. Today, Harvard’s scholarly programs and centers devoted to China include the Fairbank Center for Chinese Studies, whose mission is to “advance scholarship in all fields of China Studies at Harvard;” the Harvard-Yenching Institute, established in 1928 to advance higher education in Asia in the humanities and social sciences, with special attention to the study of Chinese culture; the Harvard-China Project on Energy, Economy, and Environment, an interdisciplinary project that conducts peer-reviewed research; and the Harvard China Fund, which provides University-wide funding for China-related work, internships, and summer school. Bacow noted that the University’s newest effort, The Harvard Global Institute, was launched four years ago to provide funding for small- and large-scale research projects, the majority of which are focused on China. “Effective approaches and solutions to challenges posed by climate change, cybersecurity threats, and international relations will not be developed by a single university — or a single nation,” he said. “Change and adaptation in these and other areas will require many people collaborating across schools, sectors, and societies, as well as governments.” That collaboration is well underway. More than 1,000 students and more than 1,000 scholars are at Harvard this year from China, and they learn and work in every School, said Bacow. More than 2,500 alumni call China home. The ties between Harvard and Peking University, institutions that value the power of learning, can help rewrite the future, Bacow said. Last week, 50 people were killed in a mass shooting targeting two mosques in Christchurch, New Zealand.